Scientific name: Celestichthys margaritatus, Microrasbora sp. This is a brand new species, only first discovered last year. It was also recently renamed from "Galaxy Rasbora - Microrasbora sp." to "Celestial Pearl Danio - Celestichthys margaritatus." It comes from only one known location in Myanmar (formerly Burma) and due to over-collection is already threatened. 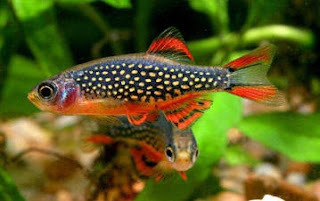 Its bright coloration and small size make it a perfect addition to a planted nano aquarium. It is similar to other danios in habits and shape. The males are much more brightly colored than the females and have a deeper blue coloration with much more red on the fins. Since this fish is so small even fully grown, it is advisable to keep it in a tank of non-aggressive smaller fish that won't try to eat it (and you won't want to loose one of these, they commonly go for $8-10 each or more, and that's only likely to go up). It prefers cooler, more alkaline water, but not much information is available on its natural habitat, as Myanmar is a military dictatorship. Like almost any fish, it will be much healthier and happier with live aquarium plants. Some hobbyists have already called for a boycott of the fish to prevent it from being collected into extinction in the wild. Fish collectors are already reporting dramatically reduced catches. Others have tried and successfully bred these little fish in the aquarium. My opinion is, if you want to seriously try to breed these fish, go ahead and get some. Otherwise, who wants to contribute to the extinction of such a beautiful species? Wow, that's one beautiful fish! Let's hope the breeding works to bring this fish into the aquarium trade. Would hate to see it go extinct. great photo - beautiful fish! Just had to comment here finally. I've been following your advice for little over 2 months now. I've gone from a fish only tank to a tank with more plants then fish. It looks better, and the fish are happier and healthier. I read your blog 2 months ago as a novice wondering if I could really do it. Let me just say it was much less painful then I had imagined it would be. And the result has been great. Even if it all blows up algae in my face, I still won't go back to fake plants again, I've seen the light. So..keep the knowledge coming, thanks. This species has been given the new common name "Celestial Pearl Danio". Look up its Wikipedia entry http://en.wikipedia.org/wiki/Celestichthys and you will see. 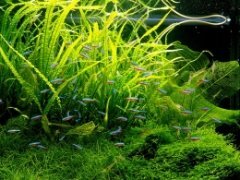 The "official" Celestial Pearl Danio Forum at www.celestialpearldanio.com has been set up. Please pay us a visit and post your photos of this amazing fish there! Read and post articles on habitat, feeding, breeding and more. These are super little fish. They have great personalities, are very lively and seem to have a real joi de vivre. I have 6 that I'm hoping will breed. They keep dancing arund each other but so far, no fry. I'm going to try adding real plants to my tank which might feel more like home to them. Hey guys, just want to share a bit of news, though belatedly (just found out this site). Here in my country (Indonesia) we have successfully bred this species for about a year, perhaps because of the similar water and climate condition, which makes it easier to breed them. Now we sell them at around US$1,5/fish. So that people would be able to get them easier and hopefully also help preventing the fish extinction.